RIOS1931 is a family business founded in 1931 and currently in its third generation that still maintains the same philosophy of their founder, Oswald Riemer - "to preserve skilled craftsmanship while focusing on fashion and meeting the technical requirements of the day." The craftspeople at RIOS1931 dedicate a great deal of time to making each watch strap. The leather is elaborately processed by hand in the manner of traditional leather craftsmanship. Gentle procedures guarantee you natural, environmentally friendly, leather products- each one representing a unique masterpiece. Each RIOS1931 watch band is given an astounding amount of time and attention throughout the production process. In fact, depending on the model, each watch band will undergo a production process of fifty (50) to one-hundred and seventy two (172) production steps! In contrast to machine sewing, the hand-stitched or Saddler's Seam uses only a single thread, which is drawn manually from one side to the other with two needles alternately. This creates a particularly even stitch pattern. It takes approximately 40 minutes to produce such a seam, which gives a watch strap a longer service life compared to machine stitching. 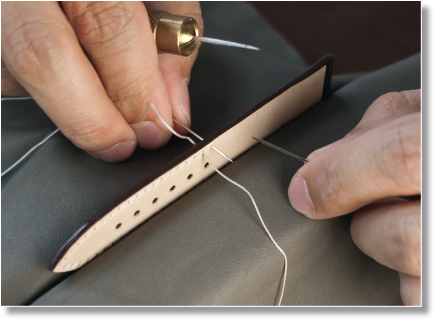 An exact hand seam requires all the skill of a master leather artisan and thus represents a piece of the finest craftsmanship. SHOP RIOS1931 WATCH BANDS TODAY! The RIOS1931 General Catalog features a wide variety of watch straps crafted from embossed leathers, genuine exotic skins, premium vintage leathers, and synthetic-water resistant leathers. The watch bands in the General Catalog are offered in a wide variety of sizes and are compatible with most watches. If you have any questions regarding compatibility, please feel free to contact us, and a member of our team will be happy to assist you! The RIOS1931 Replacement Catalog features a wide variety of watch straps that are carefully crafted to the exact OEM specifications of todays top luxury watch brands. Whether you are looking for a watch strap for Panerai, Breitling, IWC, Omega, or another top brand, you can find an extraordinary, fair priced watch strap in the RIOS1931 Replacement line that we guarantee will perfectly compliment your luxury time-piece.